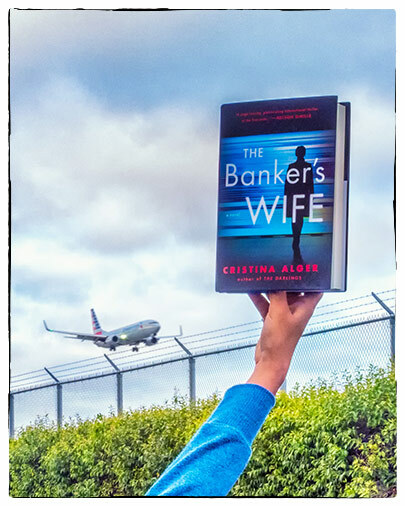 The Banker’s Wife by Cristina Alger is a brisk financial thriller. Set globally, it revolves around dirty money, hidden offshore accounts, power hungry politicians and corrupt, ultra rich bankers. From Paris to New York and Geneva to London, this slick and smart international page turner held my full attention from start to finish. This is how the adventure begins: On a cold snowy morning in November, at an airport in London, a private jet bound for Geneva takes off into the storm and before long drops off the radar, simply vanishing over the alps. After further investigation, a wreckage is found up the mountains with no survivors and the crash is labeled as yet another unfortunate weather related accident. One of the passengers aboard was Matthew Werner, a banker with Swiss United, a powerful offshore bank in Geneva. When officials come knocking at his house, bearing the tragic news, his widow Annabel Werner is devastated but also confused, because from what she knew, her husband was in Zurich, not London. Soon after, Annabel finds herself entangled in a dangerous and complicated web of secrets left behind by her husband. And as she digs deeper, she realizes her husband’s accident was not just that, and she might end up the same if she’s not careful. At the other end of the world in New York is Marina Tourneau, an ambitious society journalist, recently engaged to Grant Ellis, a budding businessman and son of USA’s next presidential candidate. Marina had to cut short her Paris trip due to the sudden and mysterious murder of her boss and mentor, Duncan Sanders. They’d unofficially been working on a high profile case involving illegal money stashing with offshore banks. Marina is determined to find her boss’s killers and uncover the global scam they’d been working on together. But as she looks for answers, she’s not ready for the secrets she uncovers and is absolutely stunned by the information unearthed that could easily bring down some of the most influential people in the world. The two parallel story lines gradually connect as the overall mystery is unveiled. Throughout the book the tension never slacks, plot twists keep coming and readers are left guessing until the very end. I was very impressed with the expertly crafted strong female characterization in this male dominated financial world. Also worth a mention is the ease and expertise with which the author explains the finer details of banking and finance, clarifying the basics without making it sound complicated or boring. There is a final unexpected twist towards the end but I was completely satisfied with how everything wrapped up. The conclusion was slightly movie-ish but no complaints. On that note this story can in fact be made into an excellent movie. Might I also mention that there are barely any bloody gory details in here, of which I am barely a fan, so yet another positive. So, in conclusion The Banker’s Wife is an intriguing and tense read full of secrets and betrayal and fraught with tension. It should certainly be on your radar if you enjoy a good thriller. Disclaimer: A free finished copy was provided by Putnam Books. I was under no obligation to write a review. All opinions are my own.